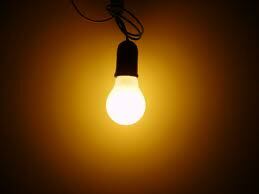 side note: This is only a stock image from google, the actual lights in the shed are much nicer. Do you remember that little, cute Maremma puppy we drove to Minnesota and brought home last year? Bianca as a puppy with John wondering what in the heck happened to his peace and quiet. 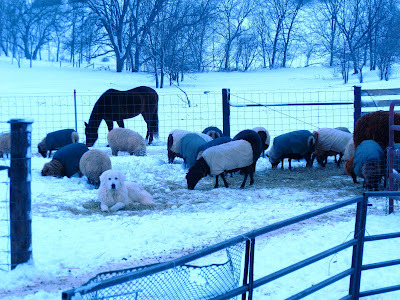 Well, here she is now.......doing what these great dogs do best, protecting her flock. We've had a few play/chase issues, but she's finally settled down enough to stop that goofiness. I'm not saying she's not still pretty goofy, but she's really become a great guardian for us. 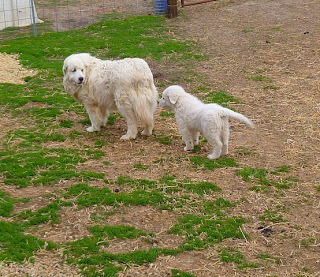 She now dwarfs John, our geriatric Maremma. He's a solid 100# dog, but Bianca makes him look like he's small when she's standing next to him. And he puts up with so much crap from her, it amazes me. Bianca "guarding" the hay pile. See what I mean? He just stands there and lets her be a pain in the rear. The good thing about Bianca's relentless pestering of John is that he's much healthier this year. Since Bianca keeps him moving, he's lost weight and is no longer struggling to get up or move. He runs around the lot and pasture with ease once again. It makes my day to see him so happy again. He really had a tough time of it when we lost Annie. John is 10 years old, but he's acting like he's a puppy more and more these days. I apologize for the picture quality, it was foggy and overcast when I took these last 2 photos and they are not the greatest. That is exactly what happened to Sansa when we got Drogo. I think the puppies really help the older dogs stay young. 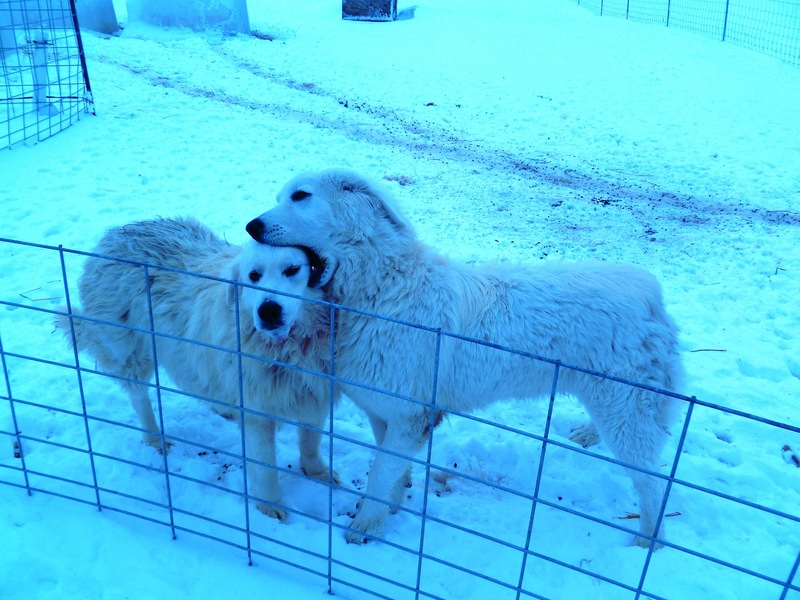 Wow, what wonderful dogs. And they are so lucky to live the life they are bred for. I am sure they are happiest when they are with the sheep.